Easily and quickly remove audio from video with powerful features. How to Remove Audio from Video Online? The raw footage produced by all digital cameras contains sound, but more often than not the quality of the audio captured by a camera microphone is underwhelming. Editing a video demands time and access to a powerful video editing app, such as Final Cut Pro or Vegas Pro. In case you don’t have the necessary skills to edit a video using Mac or PC based video editing apps or you simply don’t have enough time to go through the audio editing process, you’ve come to the right place, because in this article we are going to take you through some of the best online solutions that let you remove audio from a video effortlessly. Each of the online tools presented in this article has a video size limit, which is why you need to make sure that the video file doesn’t exceed the size limit set by the platform. Furthermore, how long the upload is going to last depends on the size of the file, so it is advisable to choose a video that is small in size in order to avoid wasting a lot of time on waiting for the file to upload. Here’s how you can remove audio from videos online. This platform offers a lot of video and audio editing tools for free, and it enables you to stabilize videos, change their size or to extract audio from video. The AudioRemover tool is quite simple to use, as you just have to click on the Browse button to select the video you’d like to upload and then click on the Upload Video button to start removing the audio from video. The entire process is automatic, so once the upload is over you can just click on the Download File link to save the new file to your computer. You can’t upload files larger than 500MB to AudioRemover which can potentially reduce the number of options you have at your disposal. The platform replaces the entire audio of a video clip and it doesn’t allow you to remove only a part of the video’s original sound. If you would like to separate the audio from a video, the Audio-Extractor tool is one of the best options available on the Internet. You just have to upload a video file to the platform from your computer or from the Google Drive, select MP3, FLAC or OGG output audio format and click on the Extract Audio button. You can then save the audio file on Google Drive, Dropbox or download it to your computer. The 123apps platform also offers Audio Cutter, Audio Converter and Voice Recorder tools you can use to edit an audio file online or add narration to your videos. However, Audio-Extractor isn’t the best option for removing audio from videos, since it only allows you to save audio files, which means that you can’t create a video that doesn’t contain sound with this tool. 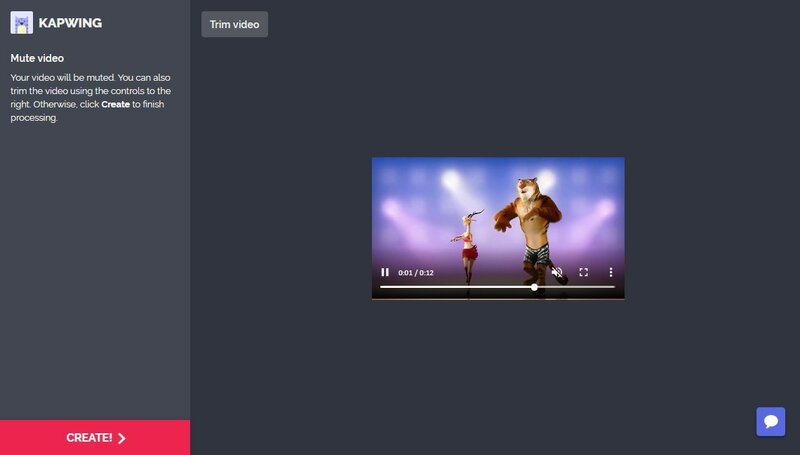 Kapwing is an online video editing platform that lets you add text or music to videos, change the playback speed of a video or create memes and stop-motion animations. The Mute Video tool reduces the video’s audio volume to zero automatically, which for all practical purposes is the same as removing an audio file from a video. After you upload a video to the platform, you’ll be able to preview it without sound, and if you like the result you can click on the Create button. Generating a muted file can take a while, depending on how long is the video, but once the process is completed, you can click on the Download button to save the video to your computer or the Edit button if you want to go through all the steps of muting a video again. All tools on the Kapwing platform are free, but the videos you mute will be watermarked unless you pay a small fee to remove the watermark. The wide range of supported audio and video formats make this platform a reliable option for anyone who wants to extract an audio file from a video or remove the original audio from the video completely. Click on the Choose File button and then select either Remove Sound or Extract Sound option. If you want to Extract Sound the platform lets you choose from MP3, iPhone ringtone or wav output audio file formats. 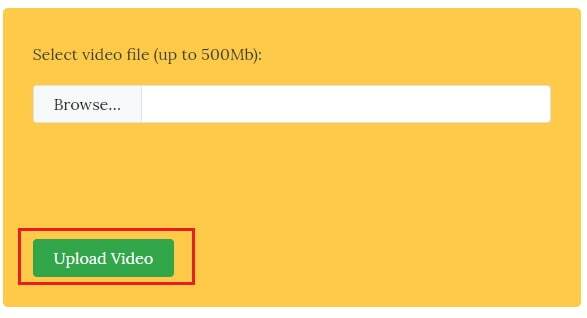 Click on the Upload&Convert button and wait for the video file to be processed. When the file is converted you can save the new video or audio file to a destination on your hard drive. However, the platform requests your mobile phone number before you can download a file and it displays ads after you click on the Download button, which can be quite frustrating if you want to remove audio from a video clip quickly. Although YouTube is not famous for its video or audio editing tools, you can still remove audio from videos in the platform’s Creator Studio. Select the video you’d like to mute and then go the Creator Studio’s Video tab. Once the options Video tab has to offer are displayed on the screen you should click on the Audio tab, that is located at the top of the screen next to Enhancements and End Screen and Annotations tabs. When the new tab opens you’ll notice that there is no option to remove audio from a video, but you can change the Featured Tracks option to Ambient and then select one of the available tracks in the menu below. The Favor Original Audio slider that is located below the preview window lets you control how much the new track is going to impact the video’s original sound. Drag the slider all the way to the right in order to avoid bringing back the original audio and then click on the Position Audio option to gain access to the audio waveform. Drag the slider located on the right side of the waveform all the way to the left to trim the duration of the new audio to approximately one second and the video will no longer have sound. This audio editing technique won’t work if you trim the new audio to zero, which is why it is important to carefully set the duration of the new audio track you added to the video. Click on the Save as New Video option to confirm the changes you’ve made and that’s it you successfully used YouTube to remove audio from a video. Extracting or muting a video online is easy since you just have to upload a video file and the online tool you’ve chosen for this task will do the rest for you. The only downside is that you have to mute the entire video since none of the platforms featured in this article allows you to choose the section of a video you’d like to mute. Which method of removing audio from videos do you like to use the most? Leave a comment and let us know.